Ideal for accessing fasteners in tight areas. Screwdriver in set features 1/4" hex bits. 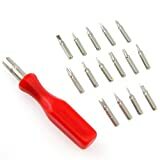 kit comprises one screwdriver head and 15 insert bits:T5, T6, T8, T10 and T15PHILIPS - #0, #1, #2SLOTTED - #2 [2mm], #3 [3mm]SPANNER #4TRI-WING #0BENT PRY TOOLROUND AWLRESET PINExact Fit Precision Machined Tips. Good for cellular phones, laptops and small gadgets. Ideal for accessing fasteners in tight areas. Screwdriver in set features 1/4" hex bits. Especially if cheap is all you are. 1) The plastic case it came in falls open often, spilling bits everywhere. 2) The blowmolded tray that is in the case, that the bits fit in, is weak as plastic wrap and the bits go sliding everywhere even when the case is closed. 3) The metal is not hard enough and deforms with use. Don't apply too much torque! 4) The torx security bit was made wrong and did not work. I don't enjoy looking for the bits in the desk drawer, and now I only use this for extreme emergencies because the bits don't hold up to much use. I bought this to open my Wii.